Ultrasound imaging is a prenatal test that uses sound waves to obtain images of your unborn baby and check their development. They were originally used during WWII to detect enemy submarines. In 1955, Ian Donald experimented with ultrasound to examine tumors he removed from patients (using steak as a control). He found that different tissues gave different patterns of ultrasound echo, allowing for the differentiation of tissue. He realized that this could be used to look at babies, prenatally. 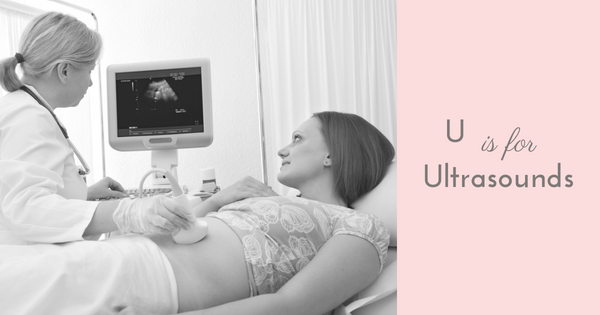 Ultrasounds became a routine part of obstetric care in 1970. When can I expect to have ultrasound appointments? Your 20 week scan is, arguably, the most vital as it checks for a number of things. The provider will examine your baby’s head, face, spine, abdomen, and organs. The placenta and umbilical cord will be studied and blood flow through the cord will be noted. This is also the time you can find out your baby’s gender! Your provider may use ultrasounds to confirm pregnancy, estimate a due date, and check for anatomical anomalies. Ultrasounds done before 14 weeks gestation to confirm gestational age are more likely to be accurate than ultrasounds done later for this purpose. They are also useful, in conjunction with hCG levels, to confirm a pregnancy with multiples. Your provider may also use ultrasound as a tool to monitor placental placement and to monitor fetal heart rate and blood flow to your baby. Ultrasounds have not been shown to improve infant outcomes but may be increasing the rate of interventions used in pregnancies. One study found that knowledge of estimated fetal weight independently increased a woman’s risk of having a c-section, yet fetal outcomes were not improved. That means OBs may be choosing to schedule c-sections based on fetal size alone, even when everything else is perfectly normal. These estimates of fetal size can vary by +/- one pound (which is a big deal when you’re talking about a baby). The American Institute of Ultrasound in Medicine has advocated for the prudent use of ultrasound imaging in pregnancy. Only qualified health care providers should perform ultrasounds, and only for medical reasons, per ACOG. ACOG discourages ultrasounds done solely for non-medical purposes (such as 3D/4D keepsakes). Obtaining these keepsake images and videos pose no extra risk IF they are done during a medically indicated exam, thus requiring no additional exposure. The content of this article is for informational purposes only. It does not take the place of consultation with your healthcare provider. This article cannot diagnose, treat, cure, or prevent any condition.